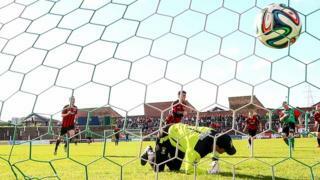 Goals from Jordan Owens, Diarmuid O'Carroll with a penalty and Gary McCutcheon prove enough for Crusaders to see off Glentoran at the Oval. Marcus Kane found the net for a late consolation for the Glens. The result sees the Crues go one point clear of the chasing pack at the top of the table ahead of Linfield's clash with Institute on Monday night.